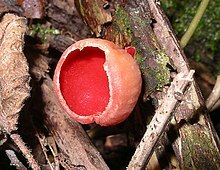 ^ Cui, B.-K.; Dai, Y.-C. Fomitiporia ellipsoidea has the largest fruiting body among the fungi. Fungal Biology. 2011, 115 (9): 813–814. PMID 21872178. doi:10.1016/j.funbio.2011.06.008. ^ Walker, M. Giant fungus discovered in China. Nature. BBC. 1 August 2011 [2012-09-07].